In addition to a spa tub, Grand Hyatt Seattle features a sauna and a 24-hour fitness center. Dining is available at one of the hotel's 4 restaurants and guests can grab coffee at the coffee shop/café. The property also has a snack bar/deli. Guests can unwind with a drink at one of the hotel's 2 bars/lounges. A computer station is located on site and wired and wireless Internet access is complimentary. Business amenities at this 4-star property consist of a business center, limo/town car service, and a meeting room. Event facilities measuring 25000 square feet (2323 square meters) include a conference center. This eco-friendly hotel also offers tour/ticket assistance, multilingual staff, and gift shops/newsstands. Onsite parking is available (surcharge). Grand Hyatt Seattle has designated areas for smoking. 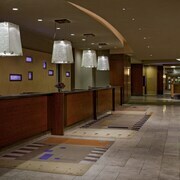 Located in Downtown Seattle, this eco-friendly hotel is steps from Seattle Central Business District and Nordstrom. Seattle Paramount Theatre and Washington State Convention Center are also within 5 minutes. Westlake Station and Westlake Ave Hub Station are within a 5-minute walk. 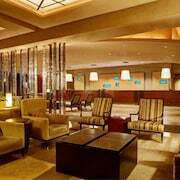 This hotel features 4 restaurants, 2 bars/lounges, and a 24-hour fitness center. WiFi in public areas is free. Additionally, a coffee shop/café, a snack bar/deli, and a spa tub are onsite. All 457 rooms offer free WiFi and free wired Internet, flat-screen TVs with satellite channels, and comforts like pillowtop beds and premium bedding. Other amenities available to guests include iPod docks, refrigerators, and room service. 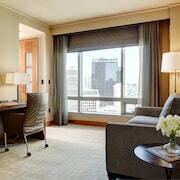 Grand Hyatt Seattle offers 457 air-conditioned accommodations with iPod docking stations and laptop-compatible safes. Pillowtop beds feature premium bedding. 47-inch flat-screen televisions come with premium satellite channels and pay movies. Guests can make use of the in-room refrigerators and coffee/tea makers. Bathrooms include bathrobes, designer toiletries, and hair dryers. Guests can surf the web using the complimentary wired and wireless Internet access. Business-friendly amenities include desks and phones. Additionally, rooms include irons/ironing boards and blackout drapes/curtains. Microwaves, in-room massages, and hypo-allergenic bedding can be requested. Housekeeping is provided daily.